SMS Assist, a Chicago-based property management company, is wooing local contractors in hopes they will become affiliates for the national company that boosts clients like Family Dollar and Best Buy. And, it claims to have 1,900 pre-sold residential clients in Las Vegas ready to place orders when the service makes its local debut March 2. Over the course of two days recently, Joe Jamrosz, an SMS Assist procurement manager, set up shop at the Gordon Biersch restaurant in Boca Place and outlined the SMS Assist story for local providers — plumbers, HVAC firms, drywall contractors and other trade professionals. SMS Assist was founded in 1999 and is privately held under the Pritzker Group portfolio. It provides a wide range of property management services to 70,000 properties — both residential and commercial — across the country. SMS Assist has a network of more than 28,000 affiliates – spanning 45 trades —available to provide the many different services their clients may need at any given moment. Josh Lessack, senior vice president of operations facilities, said “we use technology to help us track and manage all of the work orders. 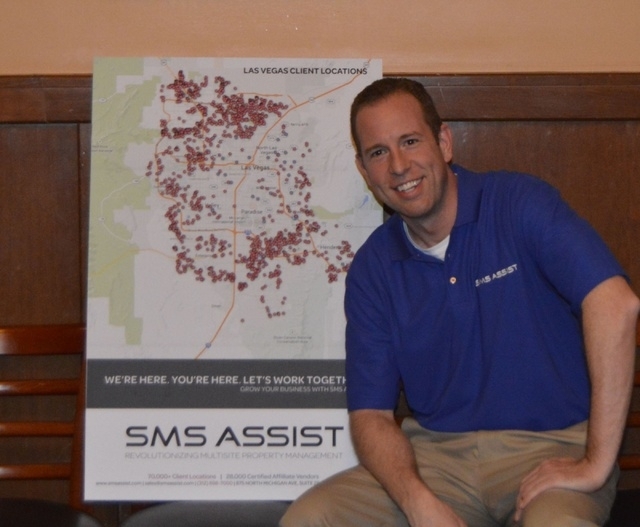 We’re putting through thousands of work orders a month.” He has been with the firm since 2003 and says it is important for SMS Assist to “keep up to date…and ahead of the field” in regards to technology. He said the SMS Assist team has been traveling “the last three or four months” and have “done 20 different events, 16 cities in six states” as part of a broad expansion push. He points to its inventory of local customers as evidence the company is poised for large growth — and profits – as it enters the Las Vegas market. One contract in which SMS Assist take great pride is the Family Dollar contract. SMS Assist started with 250 stores. However, they quickly obtained a five-year contract to serve 8,000 Family Dollar stores. They provide everything from landscaping and window washing to snow removal. Other major clients include Advanced Auto, O’Reilly’s Auto Parts, Office Depot and Public Storage.